In 2016 the world is commemorating 400 years since the death of William Shakespeare and celebrating the legacy of arguably the greatest playwright in the English language.. April 23, 2016, marks the 400th anniversary of William Shakespeare’s death at age 52. In this special year, performances will take place all around the world by major theatre companies and by small community theatres like Northumberland Players. Twelfth Night , Shakespeare’s hilarious romantic comedy, will be Northumberland Players 2016 production of a Shakespearean play. Director Paula Worley, directed Macbeth last year and A Midsummer’s Night Dream in 2014. Paula has many years experience as a Shakespearean director and has directed for her own company, Shakespeare Street Theatre, for many years before joining Northumberland Players. 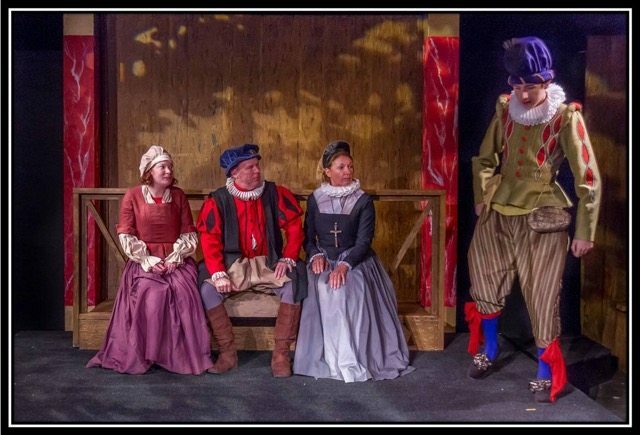 Northumberland Players’ Twelfth Night will be performed with authentic Elizabethan costumes, thanks to designer Ann Hancock and the resources of the Costume House. Maureen Holloway has created a traditional thrust stage inspired by the original Globe Theatre: enjoy an authentic slice of Shakespeare close to home! Northumberland Players strives to include youth in all aspects of theatre production. There are several younger – but seasoned – actors in Twelfth Night: Aurielle Diotte, Irelande Farrell, Shane McGowan, and Oliver Graf making his acting debut after working on the technical side of several productions. As part of the players’ Youth Theatre Outreach, there will be special matinée performances during the week for secondary school students. Read Cecilia Naismith’s preview at Northumberland Players to Present Shakespeare at Firehall Theatre.